Join Amy Smith on Wednesday, March 27th from 5:30 to 8:30 pm as she leads you in creating up to three small handmade Bitty Books of your very own. These books are perfect for mini- note taking, written journaling or art journaling, and scrapbooking. Beginners and guests with all levels of artistic experience are welcome to join the fun. All supplies are included. Join Amy one Wednesday each month at 5:30 for a Mixed Media Journaling night, and you'll have access to all of her mixed media tools and supplies, including a gel printing plate, paints, inks, pens, pencils, papers, stencils, stamps, ephemera, embellishments, and more! Bring an art journal, old book, or last years planner to alter. (If you don't have a journal of your own, some of Amy's favorites will be available for purchase during class.) Amy will show you how to create fun mixed media pages in an Art Journal format. This is a great way to establish a regular creative habit, and it will also help you to to de-stress while having fun. Beginners, and guest age fourteen and older are encouraged to attend. Class will be held at ARTworks Vass in Vass, NC. Register Here. Join Amy Smith for funky floral fun on Saturday, April 13th, from 10:00 until 5:00. She'll waltz you through the methods for using a variety of mixed media tools and materials to create Expressive Abstract Floral Paintings. Guests will begin by practicing on paper, and they'll work their way to creating a 16x20” canvas. 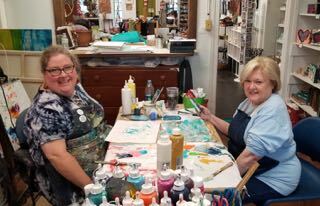 Mixed Media Florals is a class that's designed to be fun and relaxing; it's appropriate for guests with all levels of experience; all supplies are included; and it's priced at $179. Those age fourteen and older are welcome to attend. Join Amy Saturday, May 25th from 10-4pm learn to make these special pouch necklaces. They are made so that you can slip a piece of paper inside with a prayer or quote or the name of someone that you want to hold close to your heart. You will start from the very beginning by painting a blank stretched canvas and then you will construct and embellish the necklace. Guests may make as many as three necklaces. Beginners and guests age fourteen and older are welcome to attend.Class will be held at ARTworks Vass in Vass, NC. Register Here. Join Amy Smith as she leads guests in creating a richly textured and colored handbound book to express their own personal stories. Guests will paint each page in layers of color and pattern, bind them into a thick book full of glorious pages with a cross structure binding; and explore the ways in which journals may be used to express individuality. The cost of this two full day class is all inclusive, and it runs from 9:00 until 4:00 daily registration can be split into two payments. Contact Amy or ARTworks Vass to arrange.. Light snacks, water, and coffee will be provided throughout the day; and a one hour lunch break will be scheduled between 12:00 and 1:00. Guests will have use of the gallery's microwave and refrigerator, and they may choose to eat offsite or to remain in the classroom during their break. Register Here. Amy is available for one on one private creativity sessions. Sessions are tailored to individual interest and need. The focus can be on a particular art form or on how to break through road blocks to creating with freedom. Amy is currently booking limited sessions for the first half of 2019. The cost is $50 per hour with a minimum of three hours to book. Two or more day packages are also available. Amy is always seeking new venues and opportunities to teach, and is also available for private instruction. Contact her for more information and to inquire about scheduling a workshop or private session. Join Amy one Wednesday each month at 5:30 for a Mixed Media Journaling night, and you'll have access to all of her mixed media tools and supplies, including a gel printing plate, paints, inks, pens, pencils, papers, stencils, stamps, ephemera, embellishments, and more! Bring an art journal, old book, or last years planner to alter. (If you don't have a journal of your own, some of Amy's favorites will be available for purchase during class.) Amy will show you how to create fun mixed media pages in an Art Journal format. This is a great way to establish a regular creative habit, and it will also help you to to de-stress while having fun. class will be heals at ARTworks Vass in Vass, NC. Available dates are, April 10, May 8 and June 12. Register here.